The d:dicate™ 2011A Twin Diaphragm Cardioid Microphone is part of the flexible d:dicate™ Microphones Series. It combines the MMC2011 Twin Diaphragm Cardioid Capsule with the MMP-A preamplifier. This combination is for the true audiophile. It offers low distortion and totally accurate and faithful sound. The d:dicate™ 2011A‘s cardioid polar pattern makes it great for live recordings too, and as well as in studio it is often used on stage. It exhibits a previously unheard blend of clarity, richness and dynamic range and its capsule (either with ‘C’ or ‘A’ pre) is fast becoming a standard snare, kick drum and overhead miking stalwart. Inside this capsule, two opposite-facing miniature capsules are custom rebuilt. They are assembled into one double-diaphragm, single-backplate composition. This combines the advantages of small capsules with the lower inherent noise achieved from a larger diaphragm area. These capsules provide fast impulse response and large frequency bandwidth. The capsules benefit from the supreme quality of DPA’s d:dicate™ Microphone series preamplifiers instead of the usual miniature FET pres. This gives the mic much more headroom and the sound more air and precision. 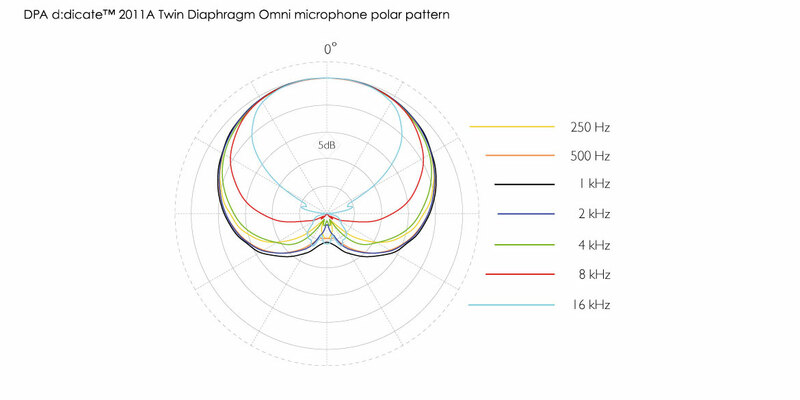 Be the first to review “DPA d:dicate™ 2011A Twin Diaphragm Cardioid Microphone” Click here to cancel reply.